King'sMotorBikes Electric Folding Bike - Ride in style! The KMB Electric Folding Bikes have a plug-and-play rechargeable battery. Far cleaner than gas-powered scooters or even hybrid cars. The battery offers a range of 6-10 miles per charge. And once you're on the road, a top speed of 12 miles per hour (contingent on the rider weight)--plenty fast enough for most side streets. Is the market too far to walk but close enough that a car seems wasteful? The bike is powered by both the electric motor and good old-fashioned foot power, with an easy-to-use twist throttle helping propel you forward. Enjoy a whole new way of commuting, one that is fast, fun, environment-friendly, and zippity green. 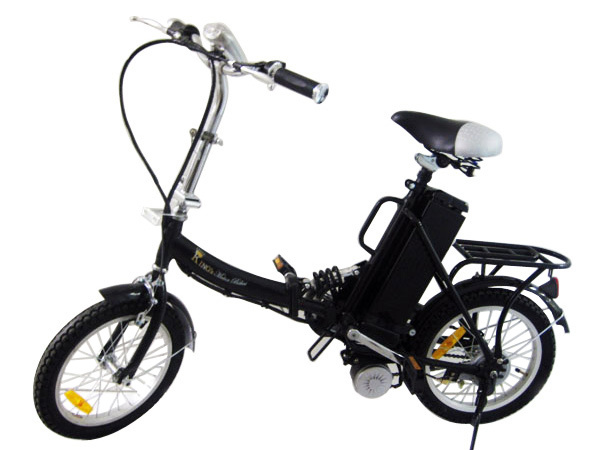 Get our new King's MotorBikes Electric Folding Bikes at a special low price. It fits inside your car, fits into the trunk of your car, place it inside your SUV, and take it anywhere you want to go! Perfect also as a gift for the holidays. Flat rate shipping to 48 continental US only. Call 877-354-3733 for shipping charge outside the U.S.